Definition at line 70 of file llpaneldirfind.cpp. Definition at line 107 of file llpaneldirfind.cpp. Definition at line 153 of file llpaneldirfind.cpp. Definition at line 161 of file llpaneldirfind.cpp. Definition at line 246 of file llpaneldirfind.cpp. Definition at line 268 of file llpaneldirfind.cpp. References LLURI::escape(), gAgent, LLViewerRegion::getName(), LLAgent::getPositionAgent(), LLAgent::getRegion(), LLControlGroup::getString(), gSavedSettings, LLAgent::isTeen(), llformat(), LLVector3::mV, VX, VY, VZ, x, y, and z.
Referenced by navigateToDefaultPage(), and search(). Definition at line 251 of file llpaneldirfind.cpp. References LLSD::asBoolean(), LLPanel::childGetValue(), getSearchURLSuffix(), LLControlGroup::getString(), gSavedSettings, llendl, and llinfos. Referenced by postBuild(), and search(). Definition at line 322 of file llpaneldirfind.cpp. Definition at line 334 of file llpaneldirfind.cpp. Definition at line 346 of file llpaneldirfind.cpp. Definition at line 364 of file llpaneldirfind.cpp. Referenced by onCommitSearch(), and postBuild(). Definition at line 358 of file llpaneldirfind.cpp. Definition at line 381 of file llpaneldirfind.cpp. Definition at line 371 of file llpaneldirfind.cpp. Definition at line 376 of file llpaneldirfind.cpp. Definition at line 116 of file llpaneldirfind.cpp. 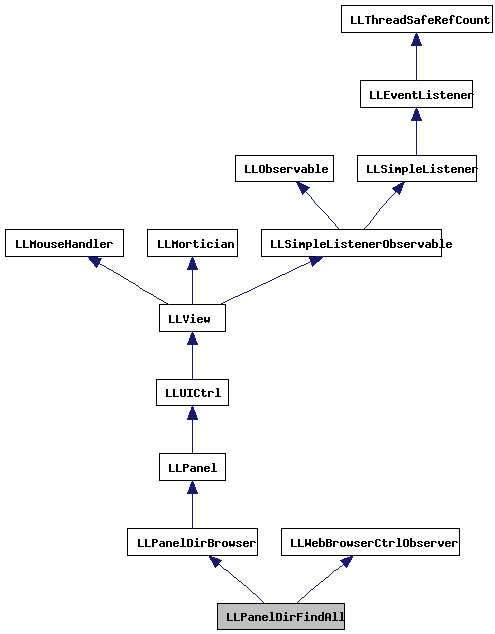 References LLPanel::childGetText(), LLPanel::childSetAction(), LLPanel::childSetCommitCallback(), LLPanel::childSetValue(), LLPanel::childSetVisible(), gAgent, LLViewerUICtrlFactory::getWebBrowserByName(), LLAgent::isTeen(), navigateToDefaultPage(), onClickBack(), onClickForward(), onClickHome(), onClickSearch(), onCommitSearch(), LLPanelDirBrowser::postBuild(), and TRUE. Definition at line 178 of file llpaneldirfind.cpp. References LLSD::asBoolean(), LLSD::asString(), LLPanel::childGetValue(), LLPanel::childSetText(), getSearchURLSuffix(), LLControlGroup::getString(), gSavedSettings, llendl, llformat(), llinfos, and navigateToDefaultPage().